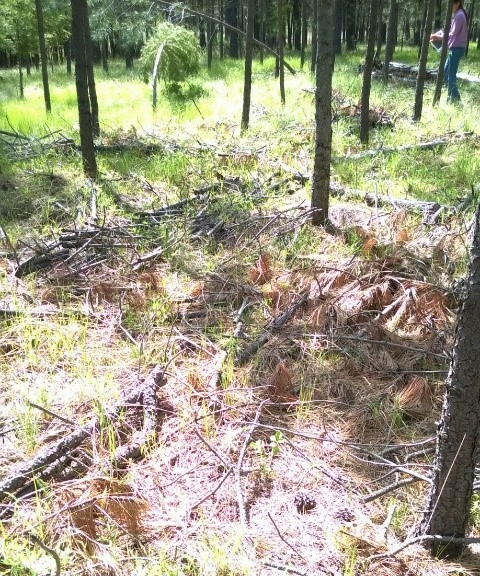 As many forest landowners already know, pine slash has a tendency to attract pine bark beetles. There are several recommendations for slash disposal to mitigate this problem. Two common methods — lop and scatter, and chipping — focus on eliminating bark beetle habitat while retaining the nutrients contained within the slash on site. Anytime you cut pine, you are releasing volatiles. Volatiles emitted from pine contain chemicals called monoterpenes. Some monoterpenes have been shown to attract bark beetles and are often included as part of the lure when trapping for bark beetles. If you are choosing between lop and scatter and chipping, which is best? You would think that chipping would be the better choice since there is no chance that bark beetles can infest the chips. But a study by Fettig et al. (2006) showed that chipping in ponderosa pine stands attracted bark beetles more so than the lop and scatter method, particularly in the spring. Why would this be? As it turns out, directly following treatment chipping releases much larger quantities of attractive monoterpenes than the lop and scatter method. If large quantities of attractive monoterpenes are released at a site where the slash has been chipped and bark beetles arrive, where are they going to go? They cannot infest the chips. They are going to go to the standing, residual trees. Although the act of thinning should increase the health and vigor of the residual trees, it will take at least a year for those trees to respond, therefore, you may wind up with bark beetle infested leave trees. So, does this mean you cannot chip? Not necessarily. Some landowners prefer to begin thinning treatments on their property in the spring; it is finally warm (but not too warm), the snow is melting off, and they are ready to go outside and get things done. Other landowners find that they have to thin in the spring for various reasons (the snow is too deep during the winter; fire season often prohibits the use of machinery in the summer; contractors cannot fit everyone in during the bark beetle “off” season). Unfortunately, as Fettig et al. (2006) found, the response of bark beetles to high concentrations of volatiles released from chips is more significant in the spring because a large segment of the beetle population is most active during this time. If you plan on chipping, it would be best to avoid treatments in the spring. The best time to chip (or do any sort of management that releases pine volatiles for that matter, including pruning), would be in late summer (late July/early August) through early winter (December). When producing chips, avoid piling them and absolutely do not pile chips at the base of any residual trees. Spread the chips out in the sun if you can. The quicker they dry out, the quicker the volatiles will dry out, and the less overall bark beetle risk there will be. Fettig, C.J., J.D. McMillin, J.A. Anhold, S.M. Hamud, R.R. Borys, C.P. Dabney, and S.J. Seybold. 2006. 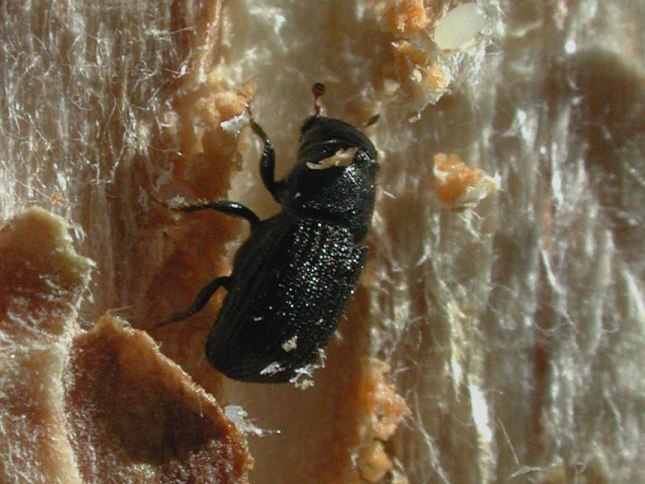 The effects of mechanical fuel reduction treatments on the activity of bark beetles (Coleoptera: Scolytidae) infesting ponderosa pine. Forest Ecology and Management. 230: 55-68.